Description: Brewed in honor of Oktoberfest, this limited release by Erdinger is a stronger, maltier variety of their regular hefeweizen. Much like your Marzens, this brew combines a darker, slightly tangy, and slightly sweet malt base with a mild hopping to create a balanced and refreshing brew. Tasting Notes: This beer was pretty much what i was expecting from an Oktoberfest hefeweizen, which was a beer that had a rich, malty base and some grainy, minerality to it. But it also had some hints of honey and mild citrus which were quite pleasant and worked well with its clean finish. Description: This Fall limited release combines a Hefeweizen base that employs wheat malts and Hefeweizen yeast, along with a generous dosing of North American hops (what I assume are Centennial, Cascade and Columbus – the 3 Cs) to create a fusion brew the combines a German Wheat beer with a West Coast IPA. Tasting Notes: This brew was quite delicious, combining the smooth drinkability and yeasty backbone of a Hefeweizen with a serious infusion of fruity, floral and bitter West Coast hops. Definitely an improvement on the many Belgian IPAs that have been fashionable these past few years. I do hope this is the beginning of a trend. Description: Longwood’s winter seasonal beer, the Winter’s Own is a German-style hefeweizen that is fashioned from a combination of 50% wheat and barley malt and brewed bock-style to create a slightly darker, stronger wheat ale. Tasting Notes: This is a beer that has been difficult for me to get my hands on, due in part to seasonal availability and distribution. Luckily, while having lunch at Longwood’s this weekend with my folks (happy birthday Pop! ), I managed to snag one. And I was a bit surprised by what I found. 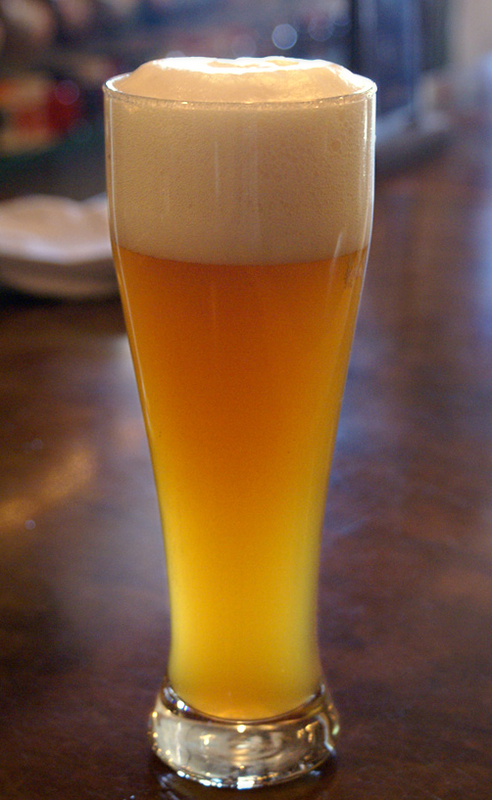 Typically, a weizenbock is a smooth, malty, and rich beer, combining the best of a German wheat and bock. Such a beer would certainly be a good winter warmer. However, this beer is fermented using what I can only assume is brettanomyces yeasts, which give it a sour, oaky punch, which when combined with a rather light malt base, leads to an entirely different experience. Not bad at all, just not what I would have expected given the style and the fact that its a winter seasonal release. I think this brew would have been better targeted to summer drinking. Still, good marks for taste and authenticity, but some deductions for missing the mark. Description: A summer seasonal beer, and what I believe is the first limited release from the brewery, this wheat ale is a mild brew that is decidedly English in inspiration. This translates to a sessional-style wheat with mild malts, a lower alcohol content, and a mild hopping that results in a smooth, refreshing taste and little aftertaste. Tasting Notes: When it comes to wheat ales, I tend to expect some banana flavor, some coriander spice, a little orange zest, some serious yeasts, or some tangy fruit flavor to offset a milder malt. However, this is due to my being accustomed to strong hefeweizens and Belgian wits, and that really didn’t diminish this beer’s refreshing nature and smooth character. Mild wheat malts, a subtle yeast backbone, and a clean finish with a Pilsner-like grainy and herbal flavor characterize this beer. Definitely a good summer thirst quencher. This completes my sampling from the 4 Mile Brewery, either through their bombers or from tastings at the brewpub itself. I can’t wait for a Fall Seasonal or some more limited releases!